These features help to eliminate the issues with visualization that row-after-row of numbers have, literally drawing the user a picture to put the numbers into context. The Sparkline option simply produces a miniature line, bar, or win/loss graph inside a cell, giving a quick, general-trend reference point. While the in-cell charts are useful, you can also add an even more basic style and apply custom rules to your cells to reflect this. Let’s assume that the range of data pictured above represents the number of attendees at the last few events your company has thrown, with a goal of at least 16. You can make it even easier to see when this goal was reached, and when it wasn’t, with some conditional formatting. This makes it much easier to identify months in which the goal wasn’t quite reached, and from there, make inferences into larger causes. The sunburst chart is essentially a more broken-down version of a pie chart, each slice further divided into slivers. In doing so, you can add more data into each chart for a more comprehensive picture. Let’s say you serve three industries, 1, 2, and 3, each with three, uniquely specialized services, A, B, and C, and each service has three tiers, X, Y, and Z. Maybe you want to determine how your sales of each measure up in your total and visually see it. Once you have all this data divided into the right columns and rows, you can insert the sunburst chart to see it, and make your business decisions accordingly. Thermometer charts are great for motivation, whether its for an overall sales goal, an internal fundraiser, or any other progressing metric. This one can be a bit tricky, so make sure you follow along carefully. Let’s assume that we’re tracking progress towards a sales goal of $150,000, and total sales thus far have equaled $37,163.48. Selecting them, click Insert, and under the Column Chart options, add a Clustered Column Chart item. With this item selected, click Switch Row/Column in the menu bar at the top of your screen. Right-click the Total Sales bar and select Format Data Series, then in the Series Options page, select Secondary Axis. You should now only see one bar, with labels on both sides. Right-click the label on the left and select Format Axis. The Axis Options Pane should appear. In the box for Maximum, type in your goal of $150,000. Repeat this process for the label on the right. Right-click the Goal Bar and select the Format Data Point option. Under Fill & Line in the menu that appears, select No fill and make the border a Solid line. Repeat this process with the Total Sales Bar, skipping the “No fill” part and selecting the color you want instead. 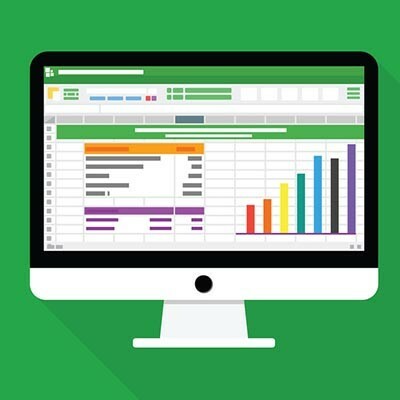 How can you think to use these added Excel abilities to display data? Leave your ideas in the comments, and make sure you subscribe to BNMC’s blog!